I had to go out of town right after Page Presents this week, so I decided to show a short animated film from my collection instead of hauling in all my puppets and props. How Raven Stole the Sun is the pilot episode of the Emmy-nominated Native-produced Canadian television series, Raven Tales, winner of Best Animated Film at the 2005 Reel to Real International Film Festival for Youth in Vancouver, Canada, Best Animated Short Subject at the 2004 American Indian Film Festival, and Best Native Film at the 2004 Santa Fe Film Festival. At 30 minutes, it’s too long for preschool story time, so I showed the beginning and then fast-forwarded to the action. Despite the somewhat long story, the kids were spellbound. My Raven puppet introduced the film and offered helpful comments and a synopsis of the part I skipped. Afterwards, everyone made a Sun sculpture inspired by the Nuxalk Sun Mask, circa 1870, at the American Museum of Natural History in New York. The mask, carved of alder wood by an unknown Nuxalk carver and stained with vermilion obtained in trade from Asia, was acquired for the museum in the early 1900s by George Hunt, a Kwakwaka’wakw employed by the anthropologist Frank Boas. In indigenous communities, Frank Boas epitomizes the plundering anthropologist who steals cultural treasures. But, under attack from all quarters for the last 400 years, indigenous people have rediscovered and renewed many aspects of their art and culture through study of objects and recordings preserved in public museums, even when so much has been lost to private collections. Chris Kientz (Cherokee), co-director and co-writer of Raven Tales, is part of an indigenous renaissance, as native people carry ancient traditions into the 21st century using 21st century technologies. Here is another story from Raven Tales, about how Bald Eagle got his white feathers. It is presented in three parts. Bald Eagle tells his version of the story, which is not very complimentary to Raven. Then Raven tells his corrected version of the story. Which one do you believe? For the February 23 Cool After School class, I introduced the kids to Rome’s Pantheon. I was inspired by the book, The Pantheon, by Lesley DuTemple (in the Great Building Feats series). We had not yet carried out any explorations of architecture, and I thought the kids would be intrigued by this building, which has been in continuous use since its construction in around 126 A.D. and whose dome is still the world’s largest unreinforced concrete dome. And the fact that the dome is open at the top (the oculus) is even more amazing! The height to the oculus and the diameter of the interior circle are the same, so the whole interior would fit exactly within a cube and could also house a sphere of the same diameter). They jumped at the chance to construct a dome of their own! We spent an hour rolling up newspaper struts and cutting them to size. Then we went out into our shade garden and built a geodesic dome! With cooperation and teamwork, we built a very cool dome! We used these instructions from Yes Mag. Overheard comment by one of the kids: “They should do this at ¡Explora!“ ¡Explora! is a hands-on children’s museum whose mission just happens to be very similar to mine: Creating opportunities for inspirational discovery and the joy of lifelong learning through interactive experiences in science, technology, and art. Head, Body, Legs: A Story from Liberia, retold by Won-Ldy Paye and Margaret H. Lippert (and illustrated by the inimitably fabulous Julie Paschkis) is a story made for shadow puppetry. In the beginning, Head is all alone. Head gets tired of eating only the things he finds as he rolls around on the ground. He dreams of the cherries that he sees hanging on the trees. So when Head meets up with Arms, he knows just what to do. Mmmm, the cherries are delicious! “Now this is really perfect,” declares Head. Then Body comes bouncing along and flops on top of Head and Arms. “Hey, watch where you’re going!” they shout, and Arms push him off. “Ah, but I do,” says Head. “And I have seen mangos growing on a tree on the other side of the river. Won’t you join us? Together we could swim across the river and pick the mangos! Body agrees. He is like a big float, and Arms paddle furiously as Head shouts out directions. They make it across the river and bounce up the bank to the tree. But, try as they might, Arms can’t reach the mangos. Just then, Head notices some legs standing around with feet on their ends. “Hey, who are you? What are you doing, just standing there?” Head calls to Legs. “We were just walking along and we ran into this tree,” Legs complain. “We can’t see where we’re going. Head soon convinces them to join up with the rest, and Legs attach to the hands . “And I need to be in the middle because I’m the biggest,” says Body. “And I need to be at the top where I can see!” says Head. So they all trade places, and eventually they all successfully work together to pick the mangos. “Now THIS is perfect!” says Head. And here they all are, dancing their happy Mango Dance. Let’s join them, shall we? 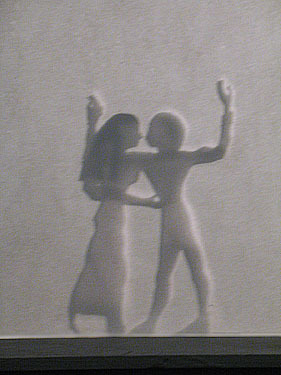 The kids loved the shadow play. Most of them were sitting rapt in front of the puppet theatre (it was reported to me), but a handful were peeking around the back and observing the play from behind the scenes. The play required careful blocking and liberal use of velcro! Afterwards the kids loved making their own Head (Arms) Body Legs persons. And who could resist dancing to the infectious African rhythms? In last week’s Cool After School class, the kids made their own shadow puppet theatres! Like a genie, Stuart conjured up some beautiful boxes from our garage, which he then proceeded to cut in half. He taped the sides so the boxes were free-standing and sturdy. 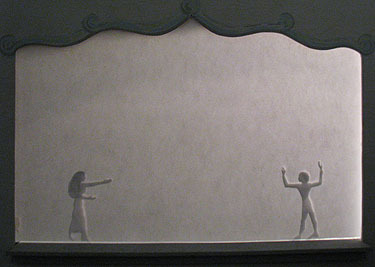 I cut out the proscenium and provided a triple thickness of tracing paper for the screen. The kids did all the rest. Here are some of the theatres in use! The next thing I knew, he had created seven shadow puppets, including Legolas, an arrow, Gimli, Aragorn, an Orc, a piranha, and a horse! Other awesome puppets included a hare and some sagebrush, Justin Bieber and a Faery, and Pikachu. The kids had a blast playing with their new puppets and theatres, and they were all swapping puppets because the range of puppets available gave them lots of ideas. 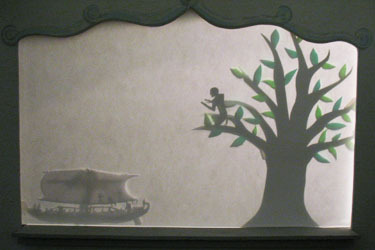 My shadow puppet show of The Shipwrecked Sailor, by Tamara Bower, was a big hit with the Page Presents crowd on February 11. Afterwards, the kids made their own usekhs. They had a lot of fun trying to Walk Like An Egyptian (and so did their parents!). Cool After School: More Shadow Puppets! I had promised the Cool After School kids that we would make shadow puppets at our next class. 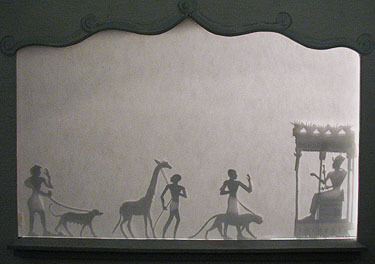 But the original shadow puppets I had made were lost along with Page. The puppets were fairly elaborate, with moving parts, and I felt too disheartened to try to recreate them. But a promise is a promise. The news of the Egyptian protesters and the success of our recent session on hieroglyphs prompted me to look for a story from Egypt. That’s when I discovered this gorgeous retelling of an ancient Egyptian fantastic voyage (discovered on a papyrus scroll that probably dates from the nineteenth century B.C.E.). I created three puppets from black posterboard: a large tree, the lordly serpent, and the sailor (who had a joint that allowed him to swim, bow, and beckon). The sole surviving sailor washes up on an island paradise. He is making a thanksgiving offering when the ground begins to tremble, and he turns to see a gigantic Serpent wearing a royal beard. The Serpent tells him that he, too, is a survivor, after his seventy-four companions were destroyed by a falling star. He predicts that a ship bearing the sailor’s countrymen will rescue him in four months, and that he will once again be reunited with his family. The Serpent’s prediction comes true. The sailor climbs a tree to hail the ship. The Serpent bids him farewell and sends him home with many rich gifts and exotic animals. The sailor presents these gifts to Pharaoh, who rewards him and appoints him lieutenant. Finally, after he has discharged his duty, the sailor hurries home to his family. His wife sees him coming, and they run to embrace. 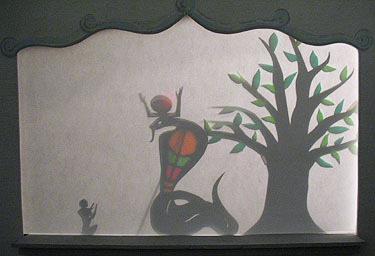 I was really pleased with how well the illustrations worked as shadow puppets. Some detail showed through the screen, and the rather stiff lateral movement and lack of moving parts seemed to echo the static, formal nature of ancient Egyptian paintings and inscriptions. The kids were enthralled, and the show even drew in some new kids who were in the library. Afterwards, they all went behind the puppet stage and began playing with the puppets. Then they eagerly designed their own puppets and proceeded to direct them in their own stories. We made lotus boxes in the Origami Cool Zone this month. For the base of the box, we folded the traditional origami masu box. For the lid of the box, including the attached lotus, we used these instructions from Good Grace Crafts. Here are the lovely results! Yes, it’s true, he is missing…and I am devastated. Page may be a sock puppet, but he is real. I hope that Page is OK. I hope that he is making some child happy and that he is not in a landfill somewhere. We kicked off the Year of the Rabbit with a shadow puppet performance of the Korean folk tale, The Rabbit and the Dragon King, at the Page Presents class on February 4; and a hand puppet performance of the same story plus a Lion Dance at our Music & Movement story time the next day. 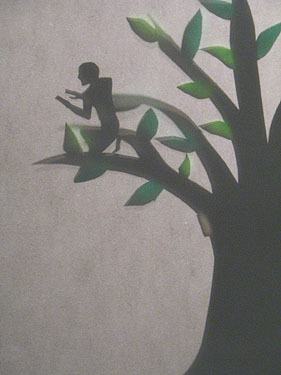 Page the Bookworm introduced the rather elaborate shadow puppets I had made, and the puppet show was a huge success. My friend Nadia had seen a great dragon craft in the February issue of FamilyFun Magazine, and she had taken photos of the article with her cell phone and emailed them to me. Now the article, including templates, is available online. But it was not available when she sent it to me, so I created my own templates based on the photographs. My husband Stuart had saved lots of egg cartons, and I spent a lot of time (including the snow day when the library was closed!) painting 25 egg cartons, inside and out. Thanks to the wonderful help of my colleague, Gail, and my fabulous teen volunteer, Gregoria, and to the serendipitous discovery of two bolts of very funky seventies upholstery fabric in a closet I was cleaning out, we had everything we needed for this truly awesome puppet. This was, hands down, the most elaborate craft we have attempted. But it was so worth it! The kids and their parents stuck with the project, complex and time consuming as it was, because they could see what a fabulous treasure they would have to take home with them. Mr. Matt had brought ten thousand origami cranes folded by his spiritual community, so we festooned the library with them, and everyone got to take some lucky cranes home with them. On January 28, our Page Presents class featured Ma’ii and Cousin Horned Toad; A Traditional Navajo Story, retold and illustrated by the great Shonto Begay. Ma’ii, of course, is Coyote, one of the Diné Holy People who is often a central character in stories that show the way to lead a good life. I learned this particular story from my friend, Eric Bitsui, when he was an English instructor and I was a librarian at Diné College in Tsaile, Arizona. Eric’s portrayal of the hardworking, taciturn Horned Toad was unforgettable, and I always feel like I’m channeling him when I tell this story, especially since Hosteen Horned Toad’s harrumphing, gravelly voice always wrecks my throat. I adhere to the Diné practice of telling stories of Ma’ii only during the winter months. So I look forward to telling this story every winter, since it is one of my favorites. At Diné College, everyone looked forward to the day in early winter when the library began checking out the great animated Navajo language films produced by the San Juan School District Media Center in Blanding, Utah (including Coyote and Beaver, Coyote and Lizard, Coyote and Rabbit, Coyote and Skunk, and Coyote and Horned Toad). Last year when I told this story, we made Horned Toad paper bag puppets. This year, I designed Ma’ii masks for the children to make. 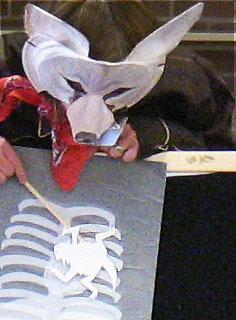 They yipped and yodeled like coyote pups as they showed off their masks.